On the British Library apple. Pseudopoeticus – still at it. Every last gram of wind. I sometimes feel that I have lived two hundred and fifty years already and sometimes that I am still the youngest person on the omnibus. The world is white, deep snow, the sky is deep blue, the mountain Old Man Tindale is blinking sleepy eyes of silver blue white, and I would like to be a squirrel and sleep until my flowers come out from deep under the snow. 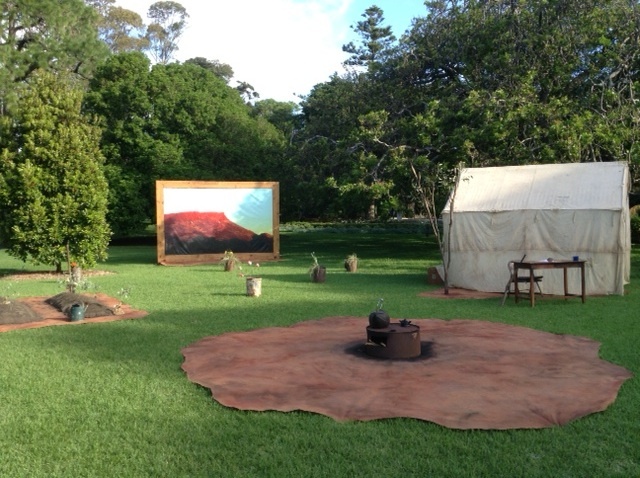 Last night on the Band Lawn, after a day of celebrations in the Botanic Gardens to welcome in the Autumn, we watched The First Garden, a play about Olive Muriel Pink (1884 – 1975). The backcloth shows Mount Gillen in the Northern Territory, one of her favourite views. Born in Tasmania, a botanical illustrator, anthropologist and gardener, Olive Pink dedicated the second half of her long life to campaigning for Aboriginal rights. In the late ’40s and early ’50s she lived in Alice Springs, mostly in an ex-Army hut, making a small income from selling cut flowers from her garden, exhibiting her artwork and cleaning the courthouse. She wrote countless stern letters to politicians on behalf of the Aboriginal people. 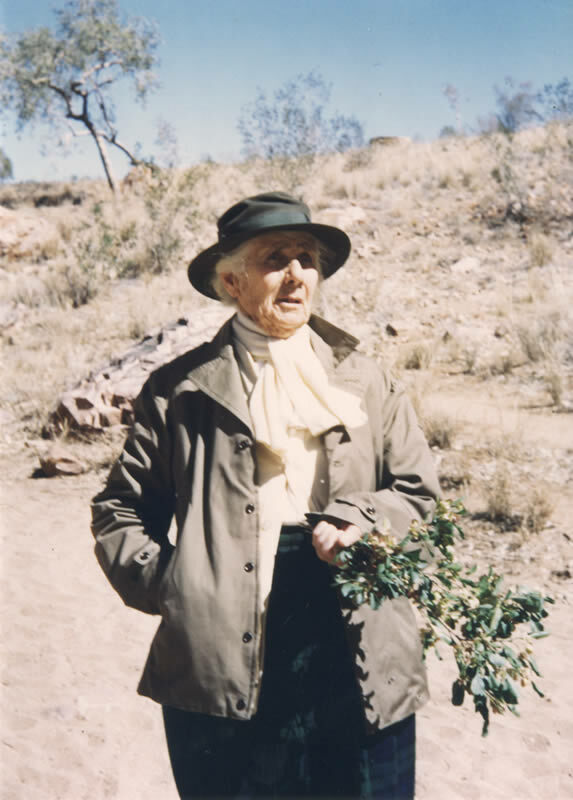 Eventually in 1956 she was granted 20 hectares of land nearby to curate as an Australian Arid Regions Flora Reserve. Her vision was to create a botanical garden using only native plants, with the, fairly paid, assistance of the local Aboriginal community, and one man in particular, Johnny Tjampitjinpa. Between 1956 and ’58, at the age of 72, she lived in a tent on site, with no water or electricity, during a time of severe drought, where she would serve visitors Bickford’s lime cordial or a glass of sherry and a slice of madeira cake. After her death the garden was renamed in her honour and opened to the public in 1985. At one point in the play Miss Pink says to Johnny ‘The world began with a garden. Let’s hope it ends with one.’ It was a powerful story of one woman’s inspiring life, committed to the preservation of the land she loved and the people who’d been its caretakers for so long, before the arrival of the European invaders. I keep hearing stories here of white folks, often women, who devote much of their time and energy to the ongoing restitution. 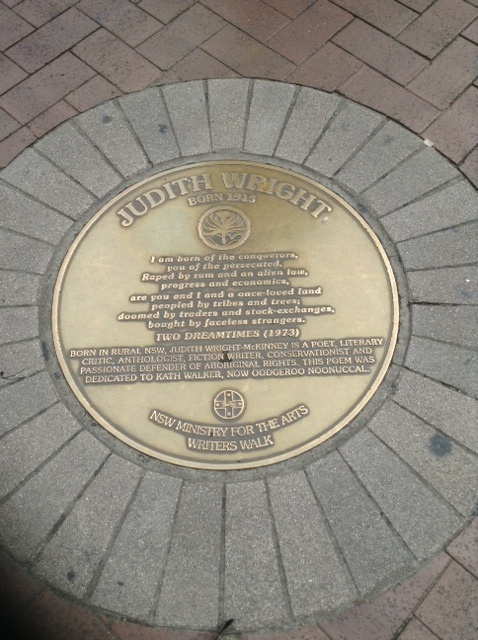 The poet Judith Wright (1915 – 2000) was one of them. Towards the end of her life she stopped writing poetry to devote more time to the causes of environmentalism and social justice, inseparable in this country, that were so close to her heart.